1. 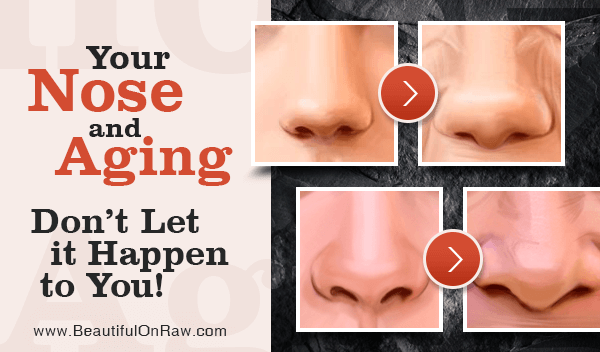 Improve the Shape of Your Nose Naturally. As we think about aging, for most of us sagging skin comes to mind. Wrinkles. Blemishes, of one kind or another. But we completely forget our own noses. But it's the nose, even more than wrinkles, that steal our attractiveness as we age. What happens, exactly? Your nose goes through some big reshaping as the years roll by. Some nasal tissues get softer, shrink, and atrophy. The nose goes south. The glands within the skin, especially at the nose tip, enlarge, causing the tip to become heavier. The tip droops, widens, and curves downward. Your nose comes to look quite different from the one you grew up with. A nose that once was just right for your face can now look too big, too bulbous, too long, even drooped or hooked. These changes are common. But they’re not always what you want—especially from a beauty standpoint. The nose, after all, stands at center stage in your face. 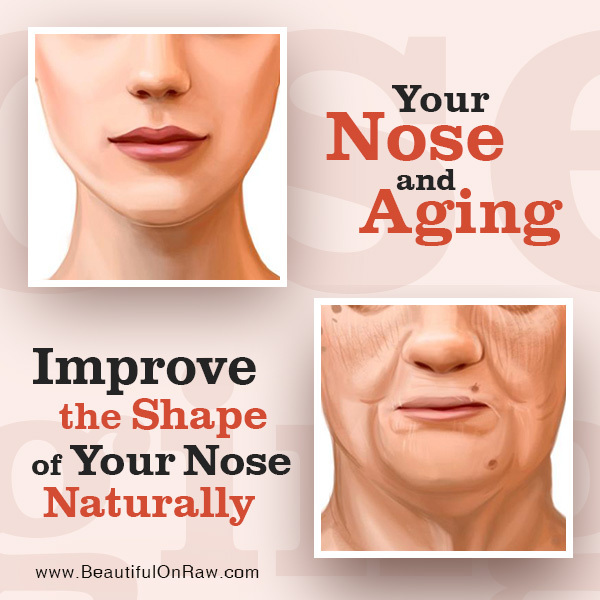 Read my new article: Your Nose and Aging: Improve the Shape of Your Nose Naturally. 2. Are Facial Exercises Damaging? If we train our muscles, they can quickly become “younger.” Why do we care if the interior muscles that we can’t see are youthful? But that is not the only benefit. A facial workout improves blood circulation and that’s what improves the condition of your skin. And yet, some doctors are against facial exercises. Here's why...read my article: Are Facial Exercises Damaging? You Must Know the Truth. One of the challenges that many women are facing is fitting the facial exercises into their daily routine. When you already have a full schedule, setting aside another 20 to 30 minutes each morning and evening seems overwhelming. 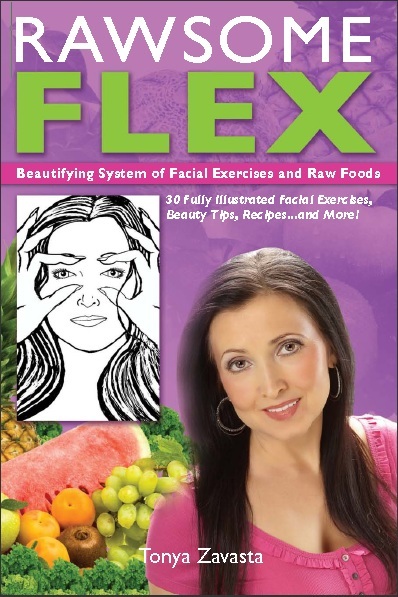 Make sure you read: How to Fit Facial Exercises into Your Busy Schedule. 3. New Batch of our ADVANCED Age-Defying Serum is here! When I first brought in my vanilla cream, it fast became a hot item. Then we changed the scent to floral. I was flooded with emails clamoring to get the vanilla scent back. Now, when our Glow cream is vanilla-scented, I get occasional complaints a person wants the floral scent. If you’re one of these people who prefer floral, or you just want a change of scents, try our Advanced Age-Defying Serum. We have a new batch in. The floral scent is 100% natural and produced with rose-scented geranium oil. It’s delicate and delightful. Geranium essential oil, due to its strong astringent properties, is good at inducing tightening of muscles, gums, intestines, tissues, blood vessels, and—especially—your skin. Addition of geranium essential oil to your cosmetics can give you a highly toned look, preventing sagging skin. It’s known to be affective in reducing the look of wrinkles and fine lines. Its antibacterial properties make it idea to deal with redness of your skin. It also prevents skin infections from occurring. Goji berry seed oil, sea buckthorn fruit and seed oil contain powerful antioxidants that provide essential protection from environmental damage. Apple stem cell extract, derived from the rare Uttwiler Swiss apple variety, is a revolutionary active ingredient with demonstrated anti aging effects. Pro-Coll-One+®, a breakthrough wrinkle care ingredient, naturally derived from hydrolyzed soya, helps boost collagen synthesis, smooth out the skin's micro-features and reduce crow's feet. 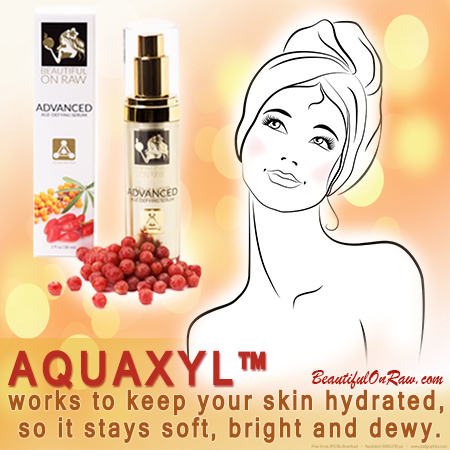 AQUAXYL™, derived from natural sugars, helps the skin’s hydration, improving water reserves and limiting water loss by realigning cutaneous water flow to better moisturize and strengthen the skin. How to survive holiday dinner parties as a raw foodist. Can you really have a truly raw cosmetic product?